Generally speaking spiny mice are quite healthy little pets, but they do have their own share of problems. The spiny mouse health articles deal with them, taking a special look on the common health problem that is preventable by correct feeding - obesity. Spiny mice are generally very healthy little pets. They do not have any common diseases, there haven't even been ectoparasites or tumors detected. However, you should worm your spiny mice regularly. Spiny mice have very fine coats, which do not protect them from drafts too well. After all, spiny mice do originate from rather hot climates. Young babies and also old spiny mice seem to be especially susceptible to getting a cold, while other individuals in the same tank can appear quite healthy. It could be, that these spinies are just asymptomatic carriers of the cold ? or it is a question of something else than just a viral disease. Heat lamps can help with this problem, medication may also help. It pays to worm your spiny mice regularly, preferably twice a year. Spiny mice do get occasionally endoparasites, which can be fatal if left untended for. As with all ailments, the best method of action is prevention. Spiny mice can get endoparasites from other spiny mice or from food collected from outside (always wash carefully all grasses etc. collected from the nature) or from dirty conditions (always remove fresh food no later than the next day). If a spiny mouse has worms, the symptoms are quite easy to detect; the coat becomes coarse and dull, and the mouse loses weight even if it eats properly. Sometimes the spinie gets a pot belly ? the stomach is so full of worms the poor spiny mouse looks fat even though it is malnourished. Information on how to do that, as well as the right medicines can be obtained from a vet. Always consult a vet before de-worming a pregnant doe. Does should be wormed before mating them. Some aging spiny mice can get problems with over-growing teeth. As a prevention (and a great help later on as well) is making sure your spiny mice have something hard to gnaw on. Dog bisquits or dried bread are great. If the teeth have grown long enough to cause eating difficulties, take the spiny mouse to a vet as soon as possible and have the teeth cut to a proper length. A healthy spiny mouse is lively and lacks all symptoms of disease. Tail accidents are most common mishaps with spiny mice. The tail is fragile and can get easily broken if the mouse is lifted or even held by the tail. If the tail brakes off, it will never grow back! Falling down may be dangerous for a spiny mouse, so you should be very careful when handling them. Never try to catch an escaped spiny mouse with a show box - the animal is very quick and may, to its own misfortune and the owners great sorrow, get crushed under the box and die. Best cure with accidents is preventing them. Right handling and preventing the mice to escape are best ways of action for the owner and spiny mouse alike. Postpartum psychosis is a psychological disorder, triggered by giving birth. It shows as aggressive behavior towards the babies. This kind of behavior has been seen with Egyptian spiny mouse females. They chew bold spots in their babies' coat and may even chew on their ears and tails. Reasons for this disorder aren't known, but it may be hereditary. You should always monitor how the spiny mice you use for breeding take care of their young. The psychosis may be triggered by constant pregnancies or overpopulation of the cage, which are both very stressful for the animals. For cure, leave the affected mouse out of the breeding program for awhile. When the female has rested for long enough, it may get babies without any troubles. As the problem is psychological, you may never be completely certain about the female being fully cured. Therefore it would be better to leave the original females suffering from the psychosis out of your breeding programmed. In addition to being hereditary, the psychosis may be learned, as some young females copy the behavior. However, you may use females with learned behavior for breeding, as the period of psychosis-like behavior will pass when the female is moved to a group with normally behaving females. A lonely spiny mouse may act like an caged wild animal, doing one set of moves repeatedly. The mouse jumps up in the air and touches the top of its tank with its feet. There have not been reported cases of this kind of behavior in spiny mice living in a group. 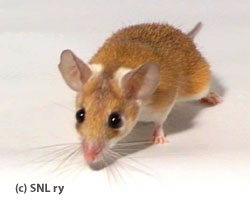 Spiny mouse, that jumps in loops when alone, may end it when introduced to a group. This is not a complete "how to" guide for feeding spiny mice, you can read on feeding at the Care and Feeding page, but here's something on the matter. Spiny mice are really omnivorous animals, it is rare that a spinie turns up its nose to anything closely resembling food. These active little spiny balls also eat relatively much and you should not try to limit their greatest joy, eating. Spinies should be allowed to eat as much as they want, but you should monitor the quality of food. Do not give your spinie fatty food, as the mouse really is (with all respect) related to grease balls and will gain weight pretty fast. Its coat will also literally drip with grease. This problem is common especially with old males, but even young mice and females aren't safe. Therefore you should rather feed your spiny mice with lab blocks than with seed mix. If you do feed seed mix, select a one with as few sunflower seeds and nuts as possible. You should also add 1 dl of oats to 1 l of seed mix (1/10 parts of oats to 10/10 parts of seed mix). Oat is a good supplement to lab blocks as well, as spinies eat them eagerly and get the energy they need for their active life style. What you should avoid, then? I already mentioned sunflower seeds and nuts. Even though it is a good thing to give dog or cat food every now and then, do not overdo it or choose a lighter brand. Also, do not mix vegetable oils in the porridges you make for your mice, even though they would love it. Cheese or fatty meat do not fit the spiny mice well either. Do avoid all fatty and prefer all versatile diets, lots of it. And remember: a small amount of fat does not ruin the beauty of your spiny mouse, so do not remove all good things from its life. Get Rid of the Fat! Cute or not, overweight is very dangerous for health. Even a spinie's old ticker can't take everything, so go on and leave the most fattening delicacies out of the spinie's food bowl! "But it loves fattening seeds!" says someone now. Right. This is exactly why spiny mice are chubby, they love eating. It is like a hobby to them! However, there are risky hobbies and this is one of them. Exactly! Do not over feed the spinies, but leave hysteria out. You see, soon enough someone will come forward and tell how she doesn't give her spinies anything but few odd seeds a day in fear of diabetes. There you are, with your poor spiny getting all too few nutrients in its diet! Therefore it is enough to keep the normal diet normal, but refrain of giving extra and fatty treats and such. Expecially older animals should be protected, as we all know how the bodily functions of elderly creatures are weaker than those of youngsters. This happens with all of us, both with humans and our animals. What Can Be Considered as Fat? We would classify a spiny mouse with greasy fur, folds of extra skin in the armpits and under the chin, as well as a lump of fat in the neck, as fat. This kind of spiny mouse can be classified as being over weight simply by looking at it. It needs lots and lots of exercise and no treats of any kind! We do know how lovely it is to give treats to spiny mice, but every fancy things has its price. As the saying goes: "you have to suffer for your beauty", but this time we are more concerned about health than looks. Spiny mice are beautiful, when they have just perfect amount of SOLID bulk around their bodies. This means that the spiny mouse is still lean, but it does have the spiny-like round and solid figure. Fat and muscle are not the same thing, even though some people seem to think so. In these occasions edcessive fat replaces good type. This means that when a spiny mouse with a poor type gets fattened up so the poor structure is masked. Wrong, wrong!! When an over weight spiny mouse is being shown, it is the responsibility of the judge to mention about the excess weight. Up until now everyone has done this, which is great - we have good judges! It would be good to warn about beginning over weight as well. In our opinion older spiny mice are a different matter. Getting slightly or even a bit more than slightly rounder is a part of natural aging process. The coat gets a bit greasy as well, but that isn't actually a fault. Look at older humans. They too get a bit rounder and then start to lose weight. This is what happens with spiny mice as well and the longer the mouse lives in the rounder state, the longer is may live as a whole. So, let us forgive a little rounder shape with old spinies! With an old spiny mouse a desperate attempt to lose weight may even be more dangerous than slight over weight. However, do notice the word "slight" in front of over weight. "It is over a year old, so I'll fatten the mouse up so it will live longer!" is not a real reason. If you understood it this way, you don't understand written text very well and need to read the above text again. How to Prevent Getting Fat? This is a good question! We wish we knew the answer. At least we recommend that spiny mice should be fed solely and thorough their whole life with lab blocks, as this way you can be certain no fattening seeds end up in wrong paws and get eaten. Excercise has an important role as well - with excercise metabolism works better. Without a doubt mates of the same species are important; lonely spiny mice can easily start eating to fill up the need for a friend! Other stimuli are important as well, as bored spiny mice start to eat to pass on time. Think like a spiny mouse; use psychology! This is a factor that people think about. Even mice do have, unless we have understood it wrong, strains or even colours which are prone to obesity. Could genes have their part in the obesity of spiny mice as well? Thinking about our own animals, during the years we have had skinny individuals who won't gain weight what ever we try and we have had spiny mice who won't loose weight no matter what... We could name one fat strain with certainty - spinies with a dude called Oberon in their pedigree. However, we have managed to keep their weight in normal levels with strickt lab block diet. They still did feel a bit fatter than the rest. This does make showing more difficult, believe it or not. We don't have the nerve to bring some spiny elephants for the judges... With all respect towards the fine line of spiny mice, but you are a bit chubby... This was just one of the things that needed to be brought up, so that spiny mouse owners would know to take away the first and last pleasure from all spiny mice - eating! Text: Lotta Ahlfors & Kaisa Kattilakoski.